BEIRUT, July 9, (KUNA): Lebanese rallyist Roger Feghali has won the 41st International Lebanese Rally for the 14th time. Kuwait’s Meshari Al-Dhafiri has led Group N in the 2018 Middle East Rally Championship by gaining 39 points. 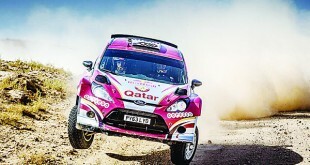 Nasser Al-Attiyah of Qatar came second with just a difference of 1.24 minutes, followed by Lebanon’s Rodolf Asmar and Udi Abu Karam respectively. The Kuwaiti rallyist has garnered a total of 78 points; 39 in this rally and 39 others in his maiden participation in Jordan Rally, with a difference of 39 points from the closest rival. Speaking to KUNA on this achievement, he said he would seek to win the group in the next round of Iran Rally. He even vowed that if he failed to join Iran Rally, then he would do it in the following round of Kuwait International Rally ahead of the winding-up of the championship in the last stage of Qatar Rally. Al-Dhafiri said he was so happy to win the first position of the group as a catalyst for clinching this championship for a new year, just as he did in 2013, 2014 and 2017. The 41st International Lebanese Rally, which makes up the third round of the 2018 Middle East Rally Championship, kicked off on Friday, with the participation of 29 cars and rivals from Lebanon, Arab and foreign countries.